Saint Bernard was born on the island of Sicily in the year 1605. His father was a shoemaker and taught his son the ways of the trade. But it was difficult for the lively youth to interest himself in this work. Upon the death of his father, he immediately left the shop and, led by the love of adventure, he took up fencing. It was not long before he became quite adept at wielding the sword. His unusual vigor qualified him to challenge any comer to a contest. As a youth and young adult he spent the greater part of his time in training and eagerly seized every opportunity to match swords with his countrymen. Although this manner of life led him far away from God, nevertheless many noble characteristics were perceptible in St. Bernard. In taking up any quarrel he liked to defend old people and other helpless and defenseless persons against violence. He frequently made devout visits to a crucifix that was highly honored by the people, and provided that a lamp be kept burning before it. Moreover, he cherished great devotion towards Saint Francis of Assisi. At one point, St. Bernard had been challenged to a duel, in the course of which he wounded his opponent mortally. In order to escape from his avengers, he sought refuge amongst the Capuchin Franciscans. 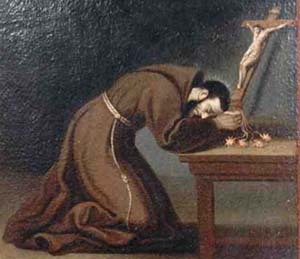 In order to atone for his sins, he begged for admission among the Capuchins as a lay brother, and on December 13, 1632 he entered the Franciscan novitiate. If in the past St. Bernard had yielded his bodily members to wayward purposes, he now used them as an atoning sacrifice unto salvation. It is reported that seven times a day he scourged himself to the blood. His sleep was limited to three hours on a narrow board, with a block of wood under his head. He fasted for the most part on bread and water. If anything delicious was placed before him, he would carry the food to his mouth so as to whet his appetite, and then lay it down without having tasted it. In spite of his austere life, he still undertook the most unpleasant and annoying tasks as being his due. St. Bernard had an especially ardent devotion at prayer. St. Bernard cherished a special love for the Blessed Mary, and encouraged others to do the same. The Blessed Mother appeared to him and placed the Divine Child in his arms. Moreover, she gave him knowledge of the day of his death four months in advance. He died at Palermo on January 12, 1667. His biographers stated that, attracted by the fame of his sanctity, there gathered for his burial so many people who raised their voices in praise of the deceased, that it was less a funeral cortège than a triumphal procession. Numerous miracles occurring at his grave promoted the cause of his beatification by pope Clement XIII in 1767 and subsequent canonization by pope John Paul II in 2001.